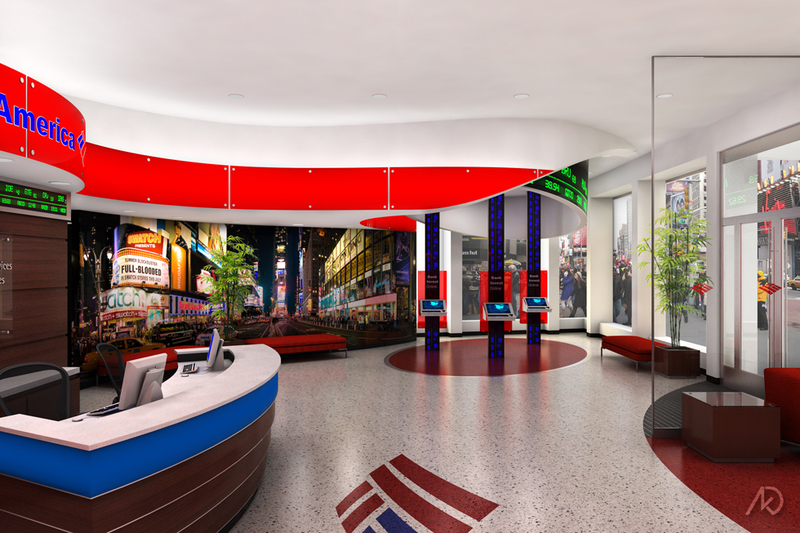 The following illustrations display the design for the Bank of America flagship located in Times Square, NYC. The location has since been closed and the new flagship re-opened at 1 Bryant Park; also designed by Gilmore Group. For this location, the storefront (first 25′ of the interior) became the main focus of design due to its prime visibility with pedestrian and advertisers. 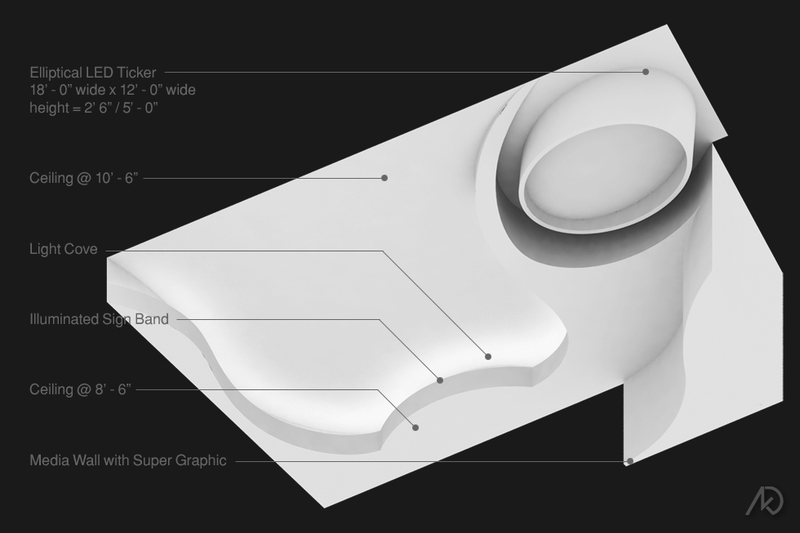 The Gilmore Group wanted something with a large impact, that would be visible to the pedestrians and become an iconic piece within the landscape of Times Square. I came up with the design idea to place an over-sized elliptical ticker in the corner storefront. I then skewed it at an angle to increase visibility and impact from the exterior. All items in the scene (except for the plants) were modeled, textured, and lit by kk. My main focus of design was the ceiling assembly. 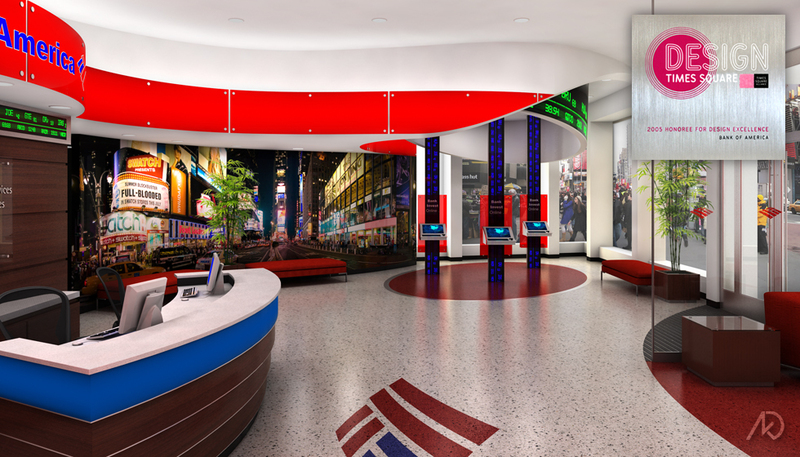 The elliptical ticker anchored the design with its large mass while the secondary elements helped to define the areas such as the information desk and the bank of ATMs. The assembly contains an elliptical ticker, sign band, light cove, and a large media wall. The interior view shows most of the main elements and their relationship to the ceiling assembly. 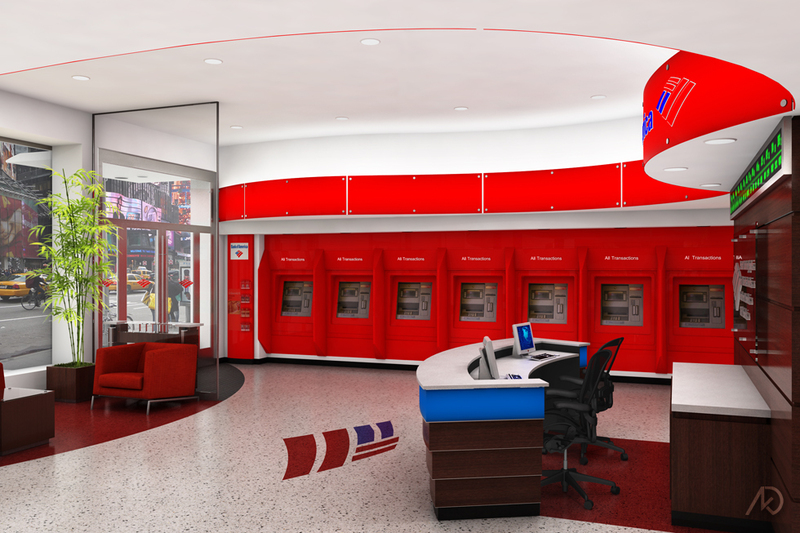 The storefront area (the first 25′ of the interior) contains the information desk, investment kiosks, ATMs, and lounge seating. The addition of kiosks became a unique way to give the elliptical ticker purpose by showcasing their importance. The elliptical ticker quickly became the hero; everything else was deigned around it’s limits and functionality. 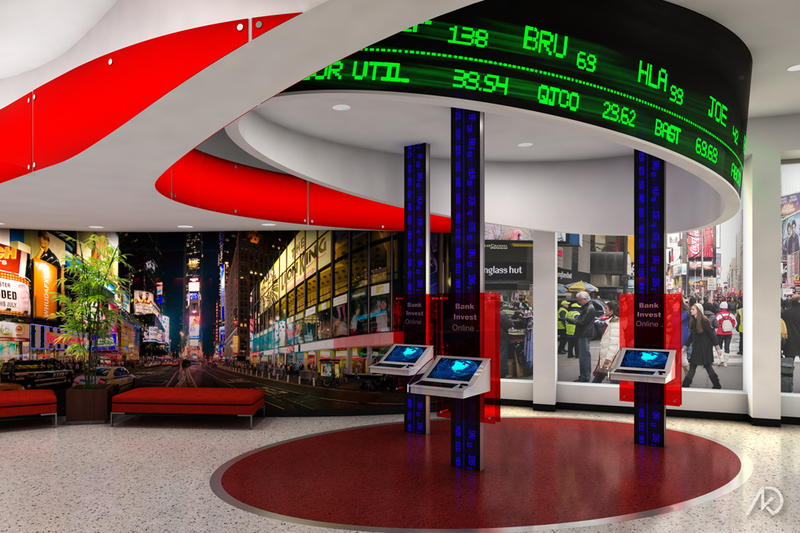 I wanted the ceiling to hug the ticker as an independent element, while creating a ceiling for the investment kiosks. Custom LED cabinets were made in order to form the complete ellipse. The ceiling assembly also provides an undulating soffit that helps to define the spaces for the information desks and the bank of ATMs. The soffit is a simple back-lit acrylic panel with a light cove at the top. The bank of ATMs may be closed off from the entire interior in order to provide 24 hour access. To the left and right of the information desk is the access to the full bank interior. 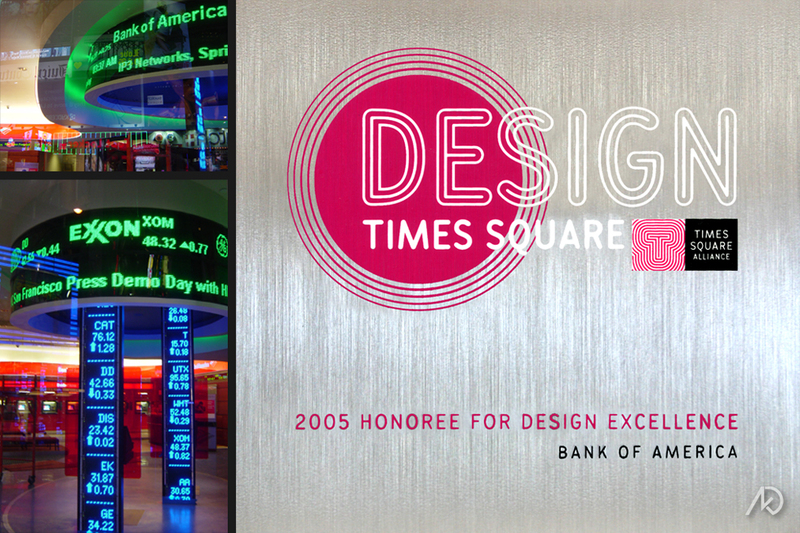 The interior received an award for “Design Excellence” from the Times Square Alliance.